This article is about the American singer. For his debut album, see David Johansen (album). For the Norwegian composer, see David Monrad Johansen. For those of a similar name, see David Johansson (disambiguation). David Roger Johansen (sometimes spelled David Jo Hansen; born January 9, 1950) is an American singer, songwriter and actor. He is best known as a member of the seminal proto-punk band the New York Dolls. He is also known for his work under the pseudonym Buster Poindexter. Johansen was born in the New York City borough of Staten Island, New York, to a librarian mother, Helen, and an insurance sales representative father who had previously sung opera. Johansen's family was Catholic. His mother was Irish American and his father was Norwegian American. 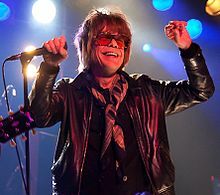 Johansen began his career in the late 1960s as a lead singer in a local Staten Island band, the Vagabond Missionaries, and later in the early 1970s as the singer/songwriter in the proto-punk band, the New York Dolls. The New York Dolls released two albums, the eponymous New York Dolls (1973), and Too Much Too Soon (1974). The bulk of the material was written by Johansen and guitarist Johnny Thunders. The Dolls were well received critically, but did not succeed commercially. In 1975, Johnny Thunders and Jerry Nolan left the band. Johansen and Sylvain Sylvain, along with Peter Jordan, Chris Robison, and Tony Machine, continued playing as the New York Dolls until 1976, after which Johansen embarked on a solo career. His first two albums, David Johansen and In Style, featured several enduring originals. Sylvain Sylvain frequently performed with him, and his band covered many Dolls songs in concert; his live albums Live It Up and The David Johansen Group Live document Johansen's reputation as an exceptional concert performer. The studio releases Here Comes the Night (which includes a signature number, "Heart of Gold") and Sweet Revenge again showcased his strengths as a writer of new material and featured a guest appearance by jazz saxophone player Big Jay McNeely. A number of the songs on Here Comes the Night were co-written with South African musician Blondie Chaplin. In 1982 Johansen was the opening act for The Who at several U.S. East Coast concerts, Shea Stadium Queensborough and Capital Centre. In the late 1980s, Johansen achieved moderate commercial success under the pseudonym Buster Poindexter, accompanied by The Uptown Horns, performing a mixture of jazz, lounge, calypso, and novelty songs, and appearing as part of the house band on the television program Saturday Night Live. As Poindexter, he scored his first hit song, "Hot Hot Hot," which, in an interview on National Public Radio's Fresh Air, he called "the bane of my existence," due to its pervasive popularity. "Hot Hot Hot" was initially written and recorded by Montserratian Soca artist Arrow. As Poindexter, Johansen often appeared with his band, The Banshees of Blue. Early Poindexter releases combined an eclectic selection of covers with Johansen's own compositions. Johansen went on to issue Buster Poindexter's Happy Hour, an album of songs thematically linked by their subject matter — alcohol. It is his most jazz-influenced release to date. It was followed by Buster Poindexter's Spanish Rocket Ship, a synthesis of rhythm and blues, calypso and Latin jazz. Johansen's legs appeared in John Lennon and Yoko Ono's 1971 film Up Your Legs Forever. Johansen acted in several films during the 1980s and 1990s, and in 2000, had a brief role on the HBO drama series Oz. He appeared in the television series The Adventures of Pete & Pete in the episode "On Golden Pete", in which he played a park ranger. He appeared in the Muppet Television segment of an episode of The Jim Henson Hour. Among his more prominent roles are that of the wisecracking Ghost of Christmas Past in Scrooged as well as the part of "Looney" in the movie Let It Ride, playing opposite Richard Dreyfuss. He starred opposite Hulk Hogan and Sherman Hemsley in Mr. Nanny, and co-starred with John C. McGinley in the movie Car 54, Where Are You?, based on the television series. He can be seen in the Jim White documentary film Searching for the Wrong Eyed Jesus in which he sings a version of Geeshie Wiley's "Last Kind Words" while in a motel room. He also had a supporting role with Mick Jagger and Emilio Estevez in the movie Freejack. He also played Halston (a hired hitman) in the anthology film Tales from the Darkside: The Movie (1990), in the segment "The Cat from Hell". He was also the guest music artist on the Miami Vice episode "The Dutch Oven" (1985) where he sang "King of Babylon". Johansen most recently portrayed the bartender in the Netflix special A Very Murray Christmas. Johansen then turned to country blues with his group, The Harry Smiths. The group was named as a tribute to Harry Everett Smith, who compiled the Anthology of American Folk Music, several songs of which were covered by the band. Johansen's second album with the Harry Smiths is titled Shaker. In 2004 Johansen reunited with Sylvain Sylvain and Arthur Kane of the New York Dolls. Owing to the success of the tour, in 2006 the New York Dolls released One Day It Will Please Us to Remember Even This, their first album in nearly thirty years. It was critic Robert Christgau's choice for album of the year. In 2009 the band released Cause I Sez So and in 2011 Dancing Backward in High Heels. Johansen hosts a weekly show, David Johansen's Mansion of Fun, on Sirius Satellite Radio while continuing to write and perform. Featuring music "from the jungles of Africa to the Bayou of Louisiana, and from Duke Ellington to Phil Spector to Billy Joe Shaver, the show is all over the musical map," truly free-form and eclectic. As of January 2019[update], the show airs on channel 30, The Loft. In October 2007, Johansen participated in "The Staten Island Composers Project," featuring work by three musicians who call the island home: Johansen; Vernon Reid, founder of the '80s rock-metal pioneers Living Colour; and Galt MacDermot, best known as the composer of the musical Hair. The Council on the Arts and Humanities for Staten Island commissioned the program and asked each artist to write 20 minutes of music conveying something of his connection to the island often referred to as New York City's forgotten borough. Johansen's opus, a cinematic and unabashedly romantic Adagio scored mostly for strings, is called "Mara Dreams the Moon Gate of Uncommon Beauty". Inspired by The Moon Gate of Uncommon Beauty, a round portal between two rockscapes in the Chinese Scholar's Garden at the Staten Island Botanical Garden. In September 2009, he appeared on Anthony Bourdain: No Reservations, the Travel Channel television program, in which he toured Staten Island with the program's host. In addition to his own albums, Johansen contributed songs to the soundtracks of the films Times Square and The Aviator ("Flowers of the City" and "Ain't Cha Glad" respectively) and guests on About Them Shoes, a CD by veteran blues man Hubert Sumlin. Another non-album track of his, "Johnsonius", appears on the 1984 compilation A Diamond Hidden in the Mouth of a Corpse and "The Rope (The Let Go Song)", a track originally recorded during the sessions for his eponymous first album, and published on the B-side of the single, "Funky But Chic", a song that was performed by the original New York Dolls before breaking up. An artist noted for his musical unpredictability and versatility, Johansen has been a consistent blues enthusiast since the earliest days of the Dolls, with covers of songs by Bo Diddley and Sonny Boy Williamson among their earliest numbers. The 2006 Dolls CD Private World : The Complete Early Studio Demos 1972/3 featured the Dolls performing songs by Otis Redding, Gary U.S. Bonds, Chuck Berry, The Shangri-Las, and Muddy Waters, in addition to versions of songs from their two Mercury albums. Also featured on the CD was a previously unreleased Dolls number, "Endless Party". During a career that has seen many changes, Johansen has worked consistently with certain musicians, including Sylvain Sylvain, drummer Tony Machine (formerly an agent who worked for Leber & Krebs, a member of the New York Dolls in 1975-1976, and a fixture in many David Johansen groups and throughout the Buster Poindexter period) and Brian Koonin, guitarist and banjo player with Buster Poindexter and The Harry Smiths, as well as keyboard player with the New York Dolls for the first reunion engagement and the One Day It Will Please Us To Remember Even This CD and tour. David is married to artist Mara Hennessey and is the stepfather of Leah Hennessey, lead singer of Make Out and creator of the Web series, ZheZhe. Stay Awake: Various Interpretations of Music from Vintage Disney Films (1988), as "Buster Poindexter and The Banshees of Soul"
September Songs — The Music of Kurt Weill (1994/1997) — "Alabama Song"
Stormy Weather: The Music of Harold Arlen (2003) — "Kickin' the Gong Around"
^ "David Johansen Biography (1950?-)". Filmreference.com. January 9, 1950. Retrieved June 15, 2013. ^ Dougherty, Margot (January 25, 1988). "David Johansen Used to Bare It with the Dolls, but Alter Ego Buster Poindexter Is a Bigger Grin". People. Retrieved December 25, 2015. ^ "The Dutch Oven". October 25, 1985 – via www.imdb.com. ^ "2006: Dean's List". Robert Christgau. February 14, 2007. Retrieved June 15, 2013. Jacobson, Mark (September 20, 2002), "The Icon: Doll Face", New York Magazine . Rosen, Richard J. (July 2000), "Rick Visits ... David Johansen", Stereophile . Rollins, Henry (September 2006), "David Johansen", Interview, archived from the original on October 18, 2006 . Wikimedia Commons has media related to David Johansen.